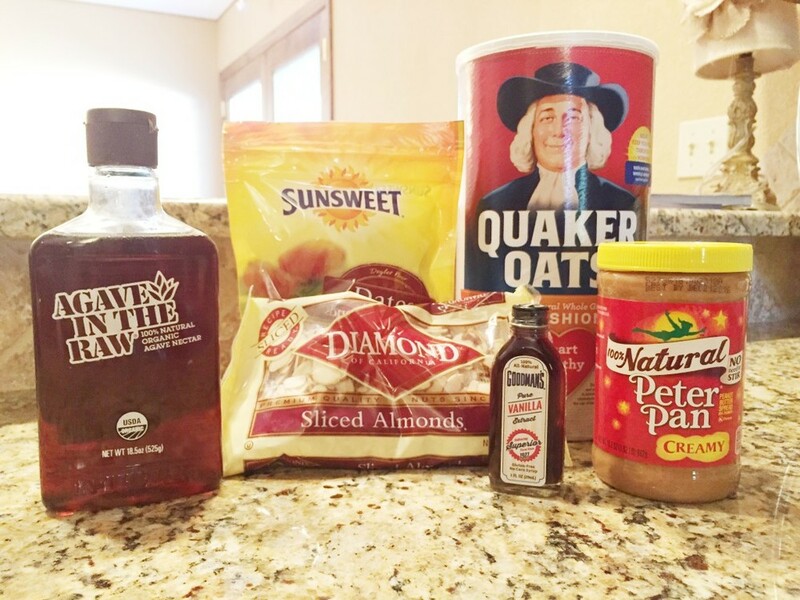 These granola bars are quick, better than store-bought and cowboy approved. What more could you ask for? They are perfect for when you have a sweet tooth or just want something quick to snack on. I just really love how versatile they are because you can really make these for whatever mood you’re in. You could easily add raisins, craisins, mini chocolate chips, pumpkin seeds, flaxseed, cinnamon, nutmeg, or even protein powder! I’ve even swapped honey for agave and peanut butter for almond butter. As long as your dates are pitted, you cannot mess this recipe up! Optional: 1/3 cup Chocolate chips or dried fruit like Craisins! Place your (pitted) dates into a food processor or blender with a splash of water. Process until it forms a doughy texture. This will be the glue that holds all of the ingredients together. 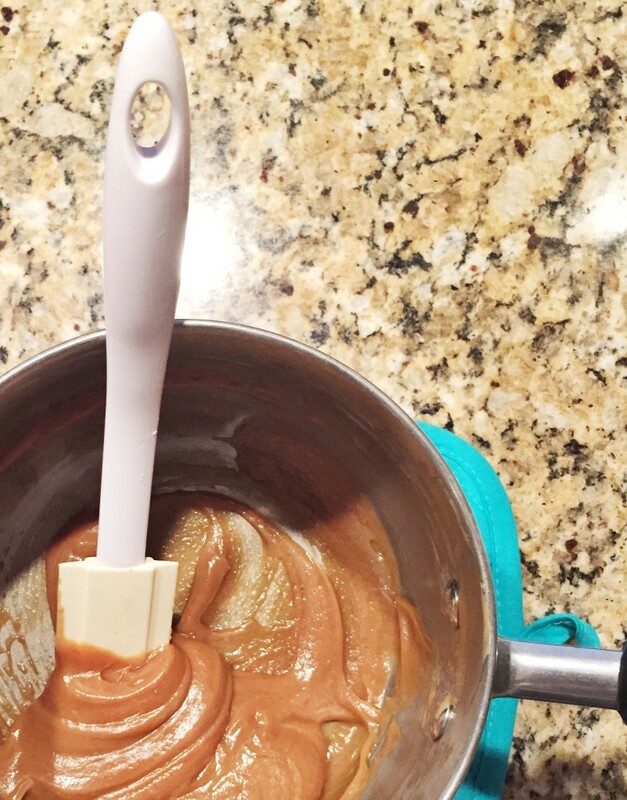 Combine your processed dates, honey and peanut butter into a large mixing bowl and mix until well combined. 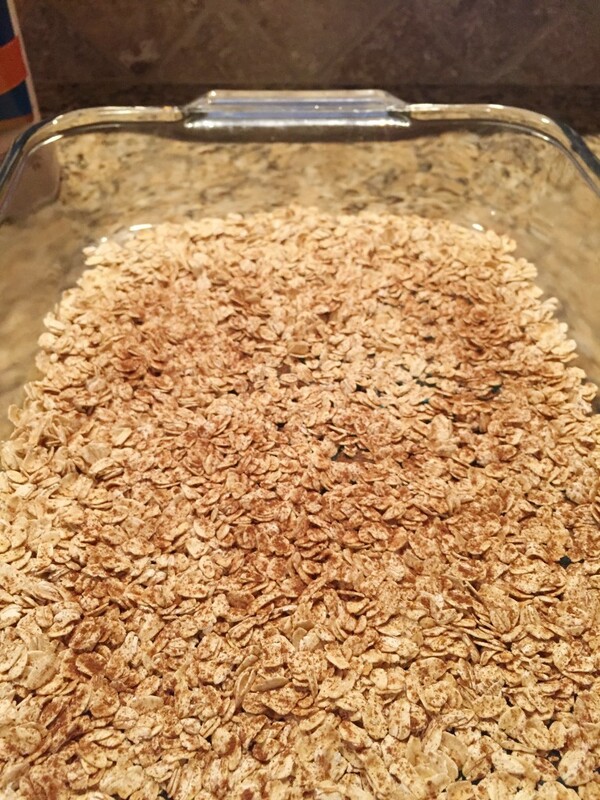 Add your oats and almonds to the date mixture and go to town mixing. This might take some upper body strength! It should be pretty thick after you get done mixing but gooey and wet enough to stick together once pressed into a pan. Toss in your optional ingredients. Normally I use mini chocolate chips but all I had on hand was regular sized. Mix well. Line a baking pan with parchment paper. I used one of my smaller (9inch) baking dishes for a thicker bar. 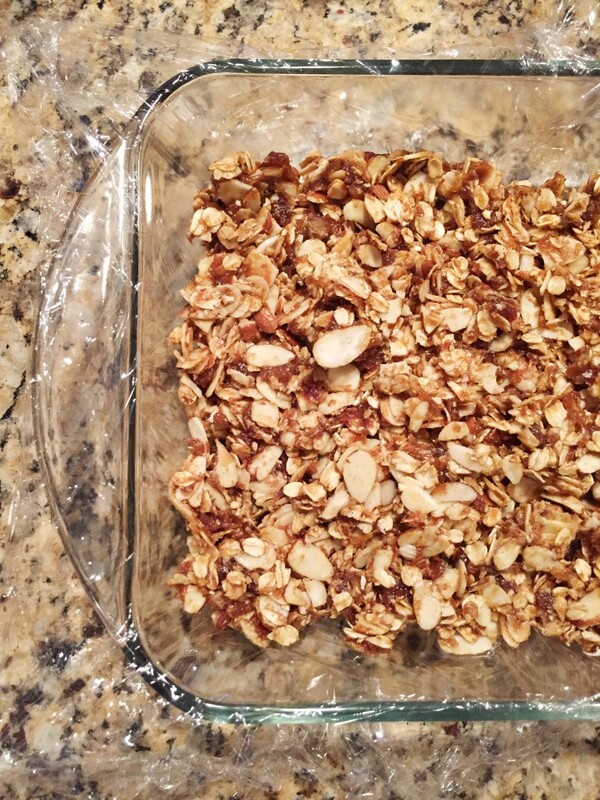 (The larger the pan, the thinner your granola bars will be.) 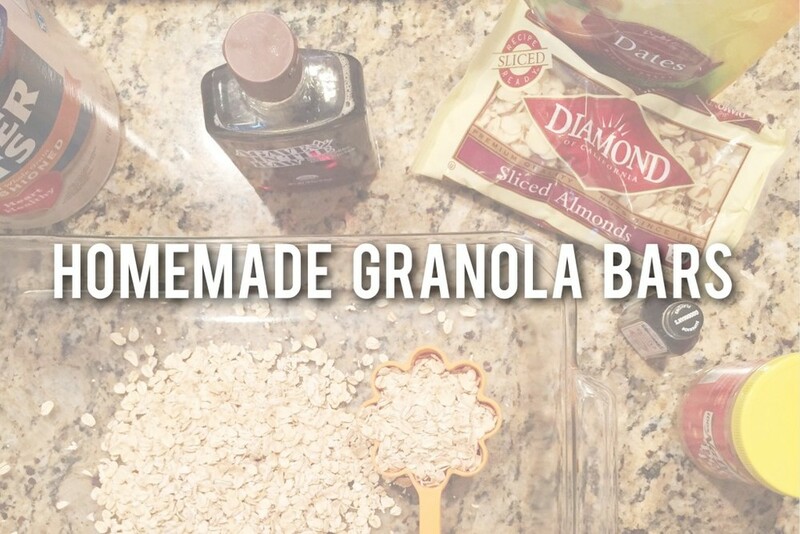 Press the granola mixture with the back of a spoon until it’s pretty flat. Then place a sheet of saran wrap on top and continue pressing the granola with the palms of your hands until smooth. 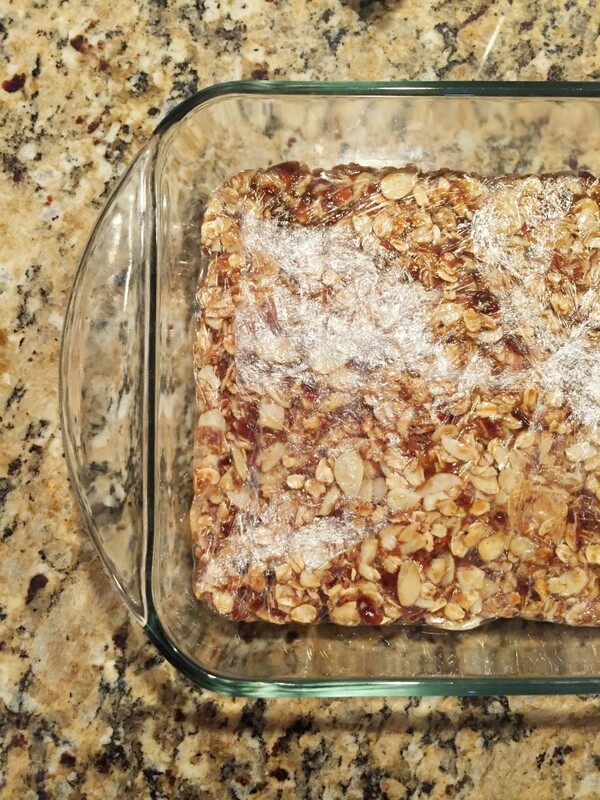 Using a small book will help compress the granola bars! This is a crucial step and can make or *break* your bars! At this time, I like to place the pan in the freezer for 20 - 30 minutes. This makes cutting them into bars so much easier. After you’ve sliced them up either put them back into the pan and cover with the saran wrap or into a freezer friendly storage container. 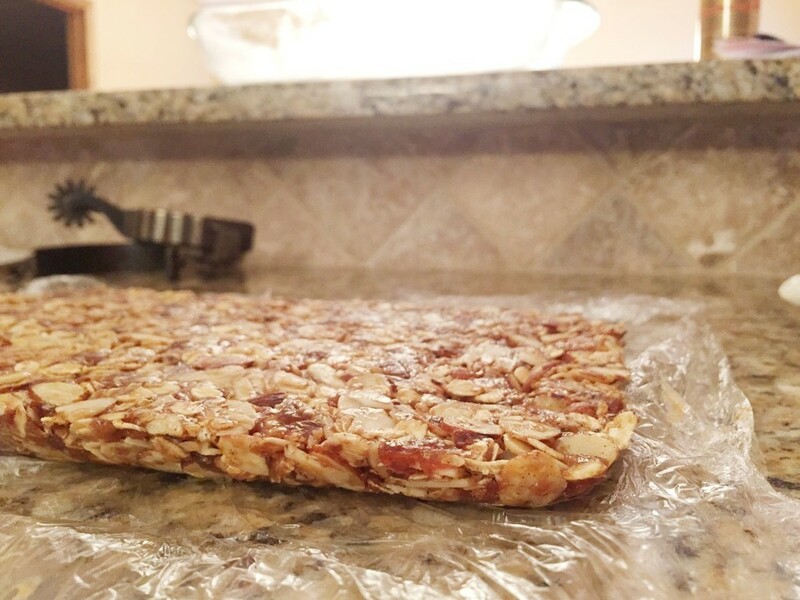 I prefer to store these granola bars in the freezer or fridge. They have never lasted more than a week so I’m not really sure how long they’ll stay fresh past that!